Calculate Form Factor at Full Load & Actual Load. Calculate Core Losses at Full Load & Actual Load. Calculate Copper Losses at Full Load & Actual Load. Calculate Stray Losses at Full Load & Actual Load. Calculate Total Losses at Full Load & Actual Load. 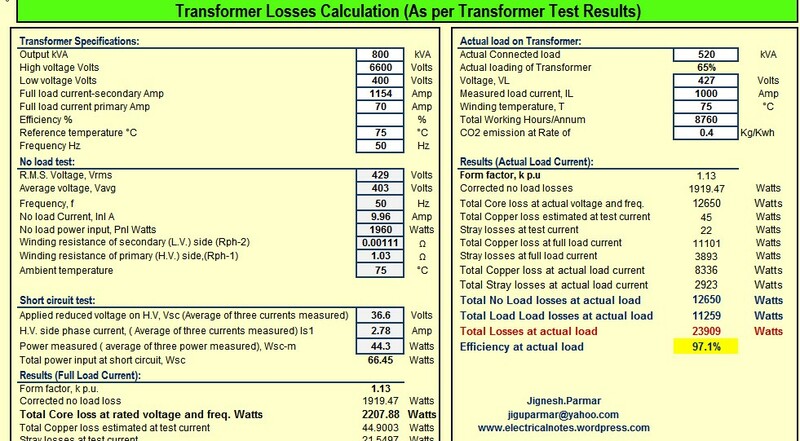 Calculate Transformer Efficiency at Full Load & Actual Load. It has been observed that some people totally copy past of this blog and parallel republished all posts of this blog again on their Blog . Please look at following totally copy past material of this Blog. After publishing Post on this Blog. Other Blogger republished the same post on their Blog .the blogger did not even change THE COLOR OF THE FONT while copy past and not even Chang the Title of the Post ….. All reader keeps their eyes on Date of original Post and date of copy past blog. Following blogger neither take any permission of the original blogger to republished the post nor give any credit by putting Reference of original post. It is wast of time to put all lists of copy past items because this copy past list is long………………….. Calculate Voltage Drop and Size of Electrical cable for following data. Cable Laying Detail: Cable is directed buried in Ground in trench at the depth of 1 meter. Ground Temperature is approximate 35 Deg. No of Cable per Trench is 1. No of Run of Cable is 1 Run. Soil Details: Thermal Resistivity of Soil is not known. Nature of Soil is Damp Soil. Full Load Current= (100×1000) / (1.732×415) = 139Amp. (1) Cable De rating Amp should be higher than Full Load Current of Load. (2) Cable Voltage Drop should be less than Defined Voltage drop. (3) No of Run of Cable >= (Full Load current / Cable De rating Current). (4) Cable Short Circuit Capacity should be higher than System S.C Capacity at that Point. Let’s Select 3.5Core 70 Sq.mm cable for Single run. Total De rating Current of 70 Sq.mm Cable= 170×0.93 =159 Amp. Here Voltage drop for 70 Sq.mm Cable (5.8%) is higher than Define Voltage drop (5%) so either select higher size of cable or Increase no of Cable Runs. If we Select 2 No’s of Run than Voltage drop is 2.8% which is within limit (5%) but to use 2 no’s of Run of cable of 70 Sq.mm Cable is not economical so It is necessary to use next higher size of Cable. Let’s Select 3.5Core 95 Sq.mm cable for Single run, S.C Capacity =8.2KA. Total De rating Current of 70 Sq.mm Cable= 200×0.93 =187 Amp. To decide 95Sq.mm Cable, Cable selection condition should be checked. Calculate Fault current at various point of Distribution system(Excel). Calculate Total impedance of upper stream. Calculate Total impedance of Lower stream. Calculate Fault current on Secondary of Transformer. Calculate minimum size of Cable to withstand Isc. 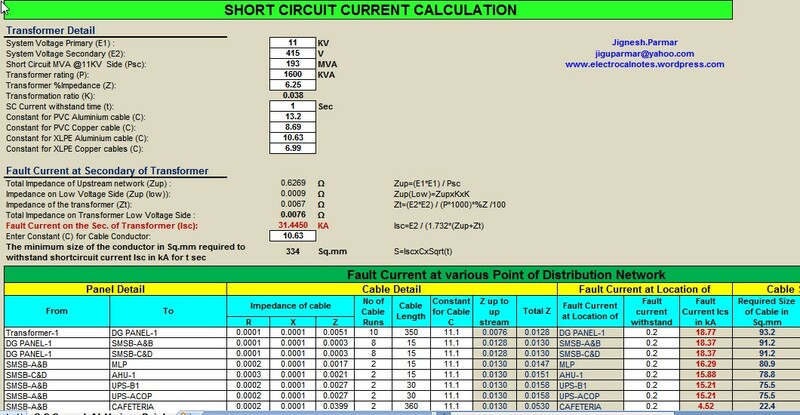 Calculate Fault current at various location of Distribution System. Calculate Min Size of Cable at various location of Distribution System.